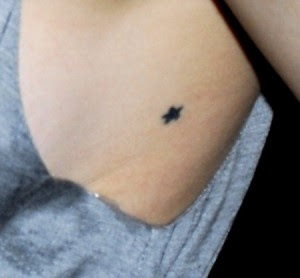 Star tattoo on her left ribs. There has been a lot of bad talk about this, since she’s only 15. But in my opinion, i think it’s great that she is who she is, and she’s true to herself. If a tattooed smoking girl at the age of 15 is who she is, then so be it. Can’t change yourself to fit what other people want you to be. I know i haven’t been posting very regularly, exams are to blame. But i thought I’d share with you guys a magazine that I learned about when i first got my tattoo. It’s Japanese (and nope, i can’t read a word of it) but i absolutely LOVE this magazine. The magazine is called ‘Tattoo Girls’. It’s basically a magazine that takes photos of girl’s tattoos on the street and asks them about their tattoos etc. I love the magazine because it’s full of a wide range of tattoos. I recently bought the ‘overseas’ edition, meaning it was all about tattoos in LA, NY and London! Okay guys, as i’m sure you’ve heard (if not, referring back to LL’s post), Lindsay recently got a new tattoo of a Marilyn Monroe quote that says ‘Everyone’s a star and deserves the right to twinkle’. I have finally found a picture of it. It’s not a great picture, but i’m sure better ones will surface soon. i still like her other ones. 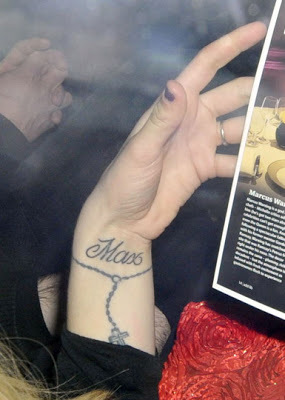 Kate moss – ‘P’ tattoo on her hip for Pete Doherty. 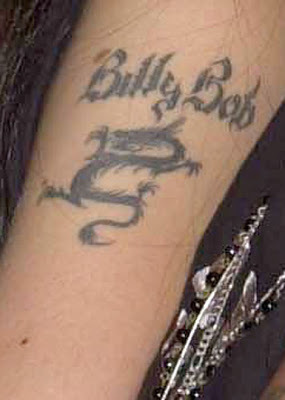 Angelina Jolie – ‘Billy Bob’ on her left shoulder (gone now) for her short marriage to him. A few pictures of tattoos devoted to another. I’ll properly add more later. So, tattooing the name of a spouse, boy/girlfriend etc., is it a do or a don’t?